WOW! I'm so flattered by all the lovely comments being left on the Moddern Kiddo blog and on our blog. You guys are just too sweet. I'm officially blown away!! 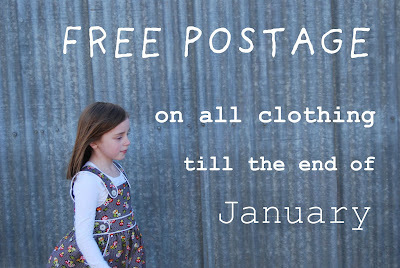 Just want to remind you all about our FREE POSTAGE offer on ALL clothing at our Madeit and Etsy stores. Don't worry, as this offer applies to all our Australian and overseas customers. so happy to have found you via Modern Kiddo, love your work!